Filipinas Heritage Library | Long Live the Long-Haired Hero! 15 Dec Long Live the Long-Haired Hero! When the United States took over the Philippines at the turn of the century, it passed the Brigandage Act of 1902 which identified anyone who showed resistance to the new government as a bandit. A band of brigands was defined as three or more persons conspiring to steal, kidnap, or do anything with force and violence. A person convicted of banditry was locked up or executed. This was the period of pacification that followed the breakout of the Filipino-American war. When the United States captured the head of the revolutionary government, Gen. Emilio Aguinaldo, in March 1901, and secured his allegiance barely a month later, “the great American nation” intensified its campaign to scare its “little brown brothers” to submission. In August 1901, the Philippine Constabulary was created “for the purpose of better maintaining peace, law, and order in the various provinces of the Philippine Islands.” This insular police force consisted mostly of Filipinos who had sided with the Americans. Among those who were identified as outlaws were Macario Sakay and his men. The president of the Dapitan chapter of the Katipunan, Sakay had become a general of the revolutionary society by the time it was discovered in 1896. In 1901, he formed the Nacionalista Party in Quiapo along with Pascual H. Poblete, Lope K. Santos, and other patriots. When Aguinaldo surrendered to the US, Sakay seized the leadership of the revolution and declared himself Supreme President of the Tagalog Republic, which he said included all the islands of the Philippines from Luzon to Mindanao. Taking over the Morong-Nueva Ecija command and assigning his deputies to take charge of the other Tagalog regions, Sakay wrote a constitution in which traitors, or supporters of the enemy, were to be punished with exile, imprisonment, or death. In May 1902, Sakay and his men declared an open resistance to the US that lasted for several years. The President ordered his men to refrain from cutting their hair, as the length of their hair would signify the length of time that they spent on the mountains, fighting for freedom. Because it has been the belief of many and of the American government that we are tulisanes (bandits), I deem it proper to issue this Manifesto to explain to them that we are not as they think we are, but are true sons of our archipelago, with our own honor and reputations. First–We, the true and loyal sons of our beloved country, love and cherish the independence of our land. Second–We, the true revolutionists, in truth and in deeds, are not tulisanes, as the government of the United States calls us. We cannot be tulisanes … for we have our own government and constitution. We fight for the sake of our land and we uphold the spirit of justice in our war with the enemies. And as you well know, we have a government which we have established in the mountains called Dimas-Alang. Third–With all sincerity, we beseech you who are the representatives of your nations in the Philippines, to help us in acquainting the rest of the world with our true intent and aims for the sake of our unfortunate country for which we are fighting. There were, however, real bandits who joined Sakay’s group, perhaps attracted by the rank of soldier that he offered to anyone who donated weapons. While Sakay and his men were in battle, there were also brigands who killed people, burned houses, destroyed crops, or stole cattle and carabaos. 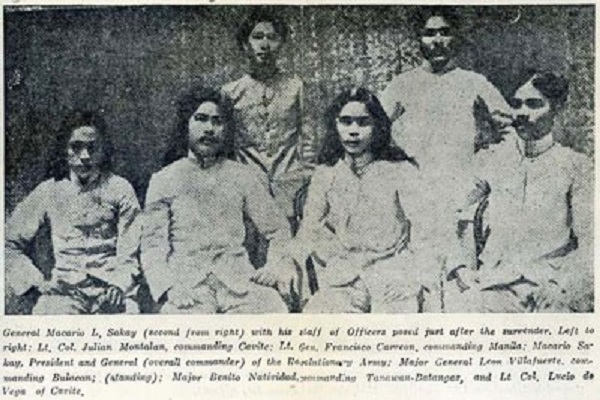 When captured, they claimed that they were not tulisanes and that they were part of Sakay’s army. Failing to co-opt Sakay and his men, the American authorities asked Dr Dominador Gomez, a political leader, to persuade the revolutionaries to negotiate with the Americans in exchange for the formation of the Philippine Assembly, which promised Philippine representation and which Gomez and the other local elite were clamoring for. When Sakay and his men heeded Gomez and went down to Manila from the mountains of Tanay on July 4, 1906, they were given a heroes’ welcome, with a brass band playing and the townspeople shouting “Long Live Sakay! Long Live the Patriots!” The patriots were invited to banquets and dances, and it was in a party in Cavite where they were treacherously arrested and jailed. At the jam-packed trial, the prosecutors demonized the revolutionaries’ ideology. They exhibited Sakay’s written orders to his officers to arrest “traitors,” and to cut their tendons and crush their fingers. Witnesses whose calves or ears were cut were also presented, as were relatives of government spies to testify against Sakay and his men.